Would you consider dangling upside-down from the top of a castle to be potentially blessed with the 'gift of the gab'? 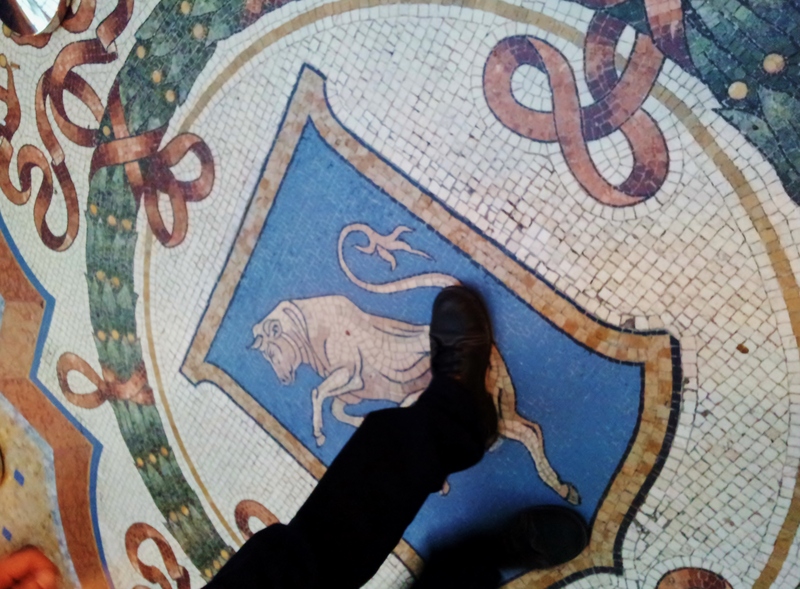 What about spinning on a mosaic bull's groins for prosperity? Or letting rats run across your feet for luck? Here are a few legends from across the world that are said to bring in good luck! 1.Spin on the bull(read:Bull's Balls) in Milan,Italy. On my first trip to Milan, when I saw people spinning on the mosaic bull's groins in the Galleria Vittorio Emmanuel, I was indeed surprised. Legend has it that spinning on the bull thrice with your right heel brings in prosperity/good luck.Did I try it out?No!Not even on my second trip.But, several tourists do so every day, every year, because of which there is quite a big hole on that spot! I visited Budapest two summers ago and while I liked a lot of things in the city, one figure stands out in my memory. The statue of the anonymous hooded writer in the City Park near Heroes Square, holding a pen in his hand.Legend has it that if you rub his pen,you would become a good writer! While I have no idea of how that story came about, I thought there was certainly no harm in giving it a try. The "gift of the gab" is like having eloquence, being able to flatter with charm and wit. Essentially, being able to talk your way out of anything.When Sonja from Migrating Miss was visiting the Blarney Castle in southern Ireland,she decided to give this legend a shot. 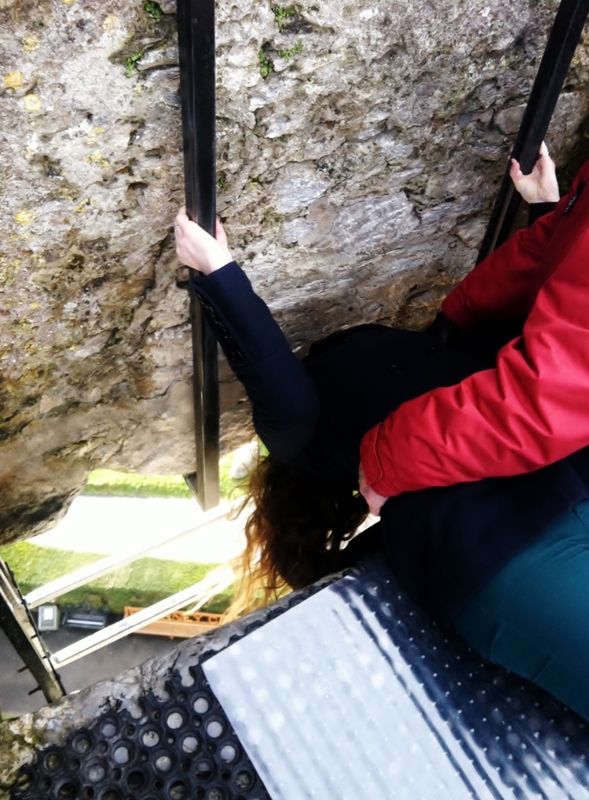 What I didn't realize is that kissing the Blarney Stone involves dangling from the top of a castle upside down! I don't know if I received the gift of the gab from risking life and limb , but it was definitely an experience I won't forget and you should try if you ever have the chance. 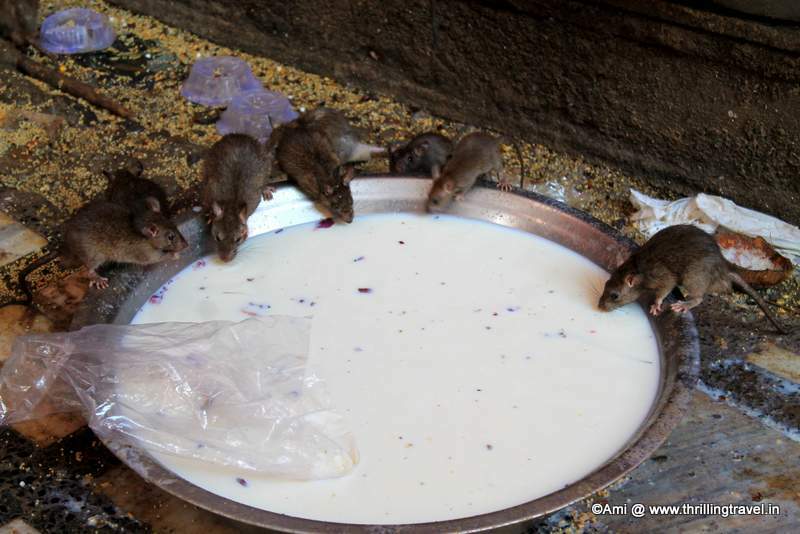 The Karni Mata Temple near Bikaner is said to be home to over 20,000 rats and has some unusual beliefs attached to it.Ami from Thrilling Travel stumbled upon it owing to an unplanned stop-over, and observed how people came to the temple to feed the rats and even took back the same food owing to a good omen. It is also believed to be good luck if one of these rats run over your feet while you are in the temple. And for extra good luck, you should try spotting the white rats. While I am not too fond of these creatures, curiosity got better of me and I did step into the temple to check out what it was all about. However, that was it! For I rushed in on my toes and rushed back right out after a quick tour while performing ballet. It sure was amusing to see the rats feed on milk and scurry around but I wasn't going to push my luck any further by attempting to let them run over me. The Sterkfontein Caves in Johannesburg, Gauteng, South Africa are millions of years old and home to thousands of fossils, most lying covered, still waiting to be discovered. One of the most famous discoveries here was made by Dr. Robert Bloom, who found the skull nicknamed "Mrs Ples". The skull is about 2 million years old and its discovery provides valuable evidence of the origins of human evolution. Heather and Lisa from Klipdrifters visited the caves and found out about the interesting legend associated with them. There is a statue of Dr Robert Bloom at the Sterkfontein Caves and legend has it that if you rub his hand, you will be granted wisdom and if you rub his nose, you will be blessed with good luck. Be careful though, if you rub both, your luck will fast run out and a darkness will be bestowed upon you... or it just means you are greedy! So, what do you think about these legends?Would you try out any of these things? This post was first published at www.europediaries.com . Check out more legends and stories on the blog.